For starters, I am not a fan of Ohio Gov. John Kasich, but I have to say after watching this video he sounds like a tough smart problem solver with realistic expectations. In the video below, Kasich gives Gov. Scott Walker a history lesson about the time republicans in the 1990's shut down the government. Kasich concludes that if the republican majority remained unwilling to sit down at the table with Clinton, nothing would have been fixed, nothing would have been done. Making an indirect slap at Scott Walker and his "divide and conquer" politics, Kasich says, "good people need to be committed to solving problems." But I'd like to see John Kasich debate on a stage facing a higher level of competition other than the low-grade red state partisan hackery of a Scott Walker or the Republicans Governors Association. At The Crossroads, Paul Ryan's Hometown Facing a Death Spiral. But Where's Ryan? I remember when the Janesville Gazette refused to endorse Sen. Russ Feingold in 2010 because they felt he lacked visibility in Janesville when General Motors was rolling out of town. The newspaper said he wasn't responsive enough to the community's needs. Of course they never held Rep. Paul Ryan's feet to the same fire. Never. Ever. This, despite Ryan being the House budget chairman and is now set to be the Chairman of the Ways and Means committee. I also recall the last time Ryan was promoted through the committee ranks of congress, he made it a point to tell the voters in his district that he won't bring home the bacon. ”If people think this will help me bring home the bacon, that’s not the kind of guy I am,” he told the Gazette. Was he scolded by his hometown newspaper for that statement? Not a chance. Strangely, a lack of visibility and disconnect from district and hometown issues seem to be working just swell for him. His enablers view "not bringing home the bacon" as fiscally courageous for Ryan, but unresponsive or detached for democrats. But, that he keeps winning re-election is proof enough for me. So I can't blame him. After GM rolled out, area "leaders" including federal officials sent by the Obama White House held an auto town recovery summit here in Janesville. The local group delivered a list of eight projects and requests for capital totaling slightly more than $40 million to the feds. Everyone was at that meeting except the guy that was needed the most in the House to write the earmarks, the district's self-described go-to federal guy, Paul Ryan. At that time (summer of 2010), Ryan was plugging his "Young Guns" book on national TV. Again, he keeps winning elections so it obviously pays for him to not be a part of the solution. Now it's year 2014 and here comes Paul Ryan's hometown support base membership of the now infamous "redstate" business lobby, Forward Janesville, and their media enabler, the Gazette, to draw up and promote a downtown "renaissance" plan consisting of ten projects that would require a major infusion of public money to complete, not including the nearly $5M to tear down an over-the-river parking plaza. This "conservative" group of dedicated Ryanroids, believe it or not, are not asking Paul Ryan for an earmark to cover the costs. Instead, they're insisting local residents must increase their taxpayer obligations in the effort to avoid an economic death spiral. Their words, not mine. One problem of course is the taxpayers they're asking for more from are the same taxpayers they lobbied a major beatdown on with their state aid reductions and tax-shifting agenda, including their support for Scott Walker. They now fear however, that going without a larger local taxpayer commitment would "be dangerous to the long-term strategy of the community." As expected, the Gazette followed up on Forward Janesville's fearmongering by joining in their call for an increased role of collectivism to make things happen. In a recent editorial, they wrote that "communities must stay progressive and offer amenities ...to prosper." They continued to ante up the rhetoric, adding that our quality of life hangs in the balance and we must invest in cultural amenities, parks and dining to attract skilled workers. All of this stuff they claim will come providing local taxpayers step up their obligations. Until then the newspaper writes, "Janesville stands at a crossroads." Their words. Guilt trip an all. Those are some heavy ultimatums. But not mentioned is Paul Ryan. There's no sign of him in any of the Gazette articles about requests for capital to help his hometown avoid this debilitating "death spiral." Why is that? Yet, the art form of taxation (collectivism) is mentioned and the willingness to accept higher taxes is encouraged along with all the prosperity higher taxes can bring. So urgently required that Janesville is now at a crossroads. Does Ryan know about any of this? If so, what is his response? But why wouldn't Paul Ryan, as chairman of the house ways and means, participate in his hometown issues for a change, write an earmark for a renaissance of prosperity that his local donor base so strongly believes in and supports? Why should residents in Ryan's hometown willfully increase their taxpaying obligations when their famous Koch star congressman thinks paying more in taxes is wrong? If NOT increasing tax obligations can send our community into a death spiral, why does he keep winning re-election preaching the exact opposite? Who should we listen to? Robert McChesney spoke at the Progressive forum in Janesville about the connection of politics and the media. Robert is a Professor at the University of Illinois and the author of Digital Disconnect: How Capitalism is Turning the Internet Against Democracy. He also co-authored with John Nichols Dollarocracy: How the Money and Media Election Complex is Destroying America. Sorry to bring you here under a false pretense. You know that's not my style, but this episode has been so well covered by Wisconsin bloggers and news outlets that it seemed fair game to change a name in the original story to consider "what if" the shoe was on the other foot. The true story revolves around Wisconsin Assembly Speaker Robin Vos(R) recent comments about the real possibility that public money might not be available to the Milwaukee Bucks for a new arena simply because its owners have donated to democratic candidates and because one of the team's new owners did something double unforgivable in the assembly speaker's eyes. He welcomed the President of the United States in Milwaukee during the Burke election campaign. "As I said this week, having one of the Bucks new owners go and greet Barack Obama on the tarmac in the middle of the Mary Burke campaign probably wasn’t the wisest decision," Vos said Sunday on "Up Front with Mike Gousha." God forbid ... Vos added that greeting the American president on Fitzwalkerstan soil amounts to ...a poke in the eye. So they’ve got to be a lot smarter with their technique. I mean, I want to bring those jobs and keep them in Wisconsin, but having us give hundreds of millions of dollars to big-time donors who give to Democrats, but also have billions of dollars of their own? That’s a hard sell. For surrre. A "smarter" technique would be to give millions of dollars to republicans if you expect a republican-majority state legislature to seriously consider legislation that might benefit your project. In fact the new Wisconsin Attorney General, Brad Schimel, said he believes that technique is the essence of representative government. Hey don't blame me, I didn't vote for any of these crooks. But just consider what the editorial staff of the Janesville Gazette would do if a democratic-leaning county board member or Janesville city council member suggested that using TIF surplus cash or taxpayer funded "incentives" for any local businesses that donate to republican candidates or their causes - would be a hard sell and likely chill support for the proposal. Divide and Conquer Club: Without Higher Taxpayer Obligations, Quality Of Life Could "Death Spiral"
According to this article in the Janesville Gazette, local development honchos including Gov. Scott Walker's notorious "Divide and Conquer" group, Forward Janesville, claim that a higher local quality of life can only be achieved by continuous "investments" from both the private and public sectors. In fact, they went so far as to say NOT obligating Janesville residents to higher taxes is so "dangerous to the long-term prosperity of the community" that they called it a "death spiral." Got that? At this point, everyone should understand that when they say "public sector investment," they mean revenue raised through government collectivism and appropriated mostly through special interest requests. That's not a difficult concept to support or appreciate IF there is some economic justice involved, but it certainly doesn't seem like the strategy one would expect from pull-yourself-up-by-your-own-bootstraps, tax-cutting small government types. When Forward Janesville's business membership needs them some free stuff, they send a junket up to Madison government for some tax cuts and transferable tax credit legislation or pander Janesville's modest tax treasury for free land, forgivable loans, TIF surplus cash or forgivable cash "incentives" for their jobless business expansions. So on one hand, a lower tax burden makes their quality of life much better. Collectivism works really, really well for them when they're on the receiving end. But, they also support local bureaucrats and political candidates whose primary idea of growth is built on lowering wages, slashing benefits and even limiting civil rights for the general wage earning population. 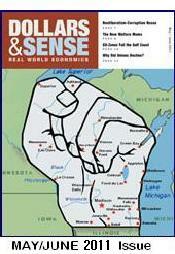 Forward Janesville agents actually referred to those worker wages and protections as burdens on economic development. Point is, when you're cutting taxes for yourself while promoting a steady beatdown of earnings on those offsetting the shift you're benefiting from, what wage-earning taxpayer would want those dystopian burdens in their future? And, speaking of dystopia. Most if not all the politicians Forward Janesville supports are also small government confederate types like Scott Walker and Paul Ryan whose ideological foundation, at least in the rhetoric they spew, is built on their own personally distorted variant of an Atlas Shrugged collectivist-free society. So how do they reconcile any of this? Well, they simply don't. But here they are, doing their Ayn-Rand-Social-Security impersonation, not just asking more for themselves like they always do, but asking the very people they beat down economically, politically and legislatively to step up their "obligations" as taxpayers - to improve their quality of life. “There's a real risk to the community as the demographic shifts start to dominate local elections and politics,” he said. “If this becomes a community that is dead set against spending public money on community improvements like the various things that have been proposed in the plan, we are going to have a hard time facilitating the growth of local companies and attracting new companies to the area. “Then you get into what some have described as the death spiral: Don't spend money, don't obligate the taxpayers to any more costs, just fix the potholes and call it a day. Most bizarre, the folks at small-government-tax-cut-for-themselves Forward Janesville seem very afraid that an older fixed-income "not Forward Janesville" demographic might actually begin demanding tax cuts and smaller government for themselves - that they call it a death spiral. I gotta' admit, the irony is delicious. If only the folks at FJ would practice what their chosen politicians preach, they would say that street potholes are not potholes at all. But instead are Ayn Rand's beauty marks. Robert McChesney, Gutgsell Endowed Professor in the Department of Communication at the University of Illinois, author of Digital Disconnect: How Capitalism is Turning the Internet Against Democracy, andco-author with John Nichols of Dollarocracy: How the Money-and-Media-Election Complex is Destroying America. Directions: from Madison route 90 until 1st Janesville exit, south on Route 26 past route 14, look for Toys R Us on the right, right on Lodge Drive, on right across from Toys R Us. The Community Room is to the left when you come in. "You will remember this day. You’ll remember this as the day the seeds of 2012 were sown." Gingrich was off by two years, but I don't think many republicans will complain. In the video below, Thom Hartmann said Dems were duped and points to the Caucus Room Conspiracy as the genesis of the strategy leading up to the GOP's success on Election Tuesday. You might recall the Caucus Room Conspiracy was a meeting held by at least 12 congressional republicans and several party operatives on the eve of Barack Obama's first inauguration. During this meeting, they vowed to relentlessly filibuster, sabotage or obstruct every piece of legislation proposed by the new president including many things republicans used to support, in an effort to win back the White House. Their plan relied on making congress appear to the American public as hopelessly gridlocked by the democratic-majority senate while preventing Obama from achieving any legislative success. It looks like their dirty plan worked. The Caucus Room Conspiracy was first exposed in the prologue of Robert Draper’s book, Do Not Ask What Good We Do: Inside the U.S. House of Representatives. To this day, none of the participants have disputed Draper's account of the meeting. Hartmann said congressional democrats, for the past five years, should have highlighted and called out participants in the caucus room conspiracy every time they obstructed. Democrats he said, should have made the "caucus room conspiracy" a household phrase. I'd say it's never too late to call out Kevin McCarthy, Paul Ryan, Jeb Hensarling, Bob Corker, Tom Coburn or Pete Sessions about this treasonous scandal and reference it in every blog posting, letter or social media comment when their names pop up in the news. Why not? RNR - Did Paul Ryan and Cabal Conspire To Take Down The Obama Presidency? Democurmudgeon - Will the Democratic Party stand for something? Please? Rock County Voters Deliver Stellar Performance Against The "Red Wave"
We now know that the final MU Poll was a reasonably accurate forecast for the governors' race when it reported a considerable uptick in enthusiasm by republican "likely" voters less than a week before the election. Some of us sounded the alarm. Others said don't believe it. Still others said the race was tied, but I thought otherwise and posted here that there is nothing magical about it. That, IF that lack of enthusiasm for voter turn-out continues to hold on election day for Democrats - Burke will certainly lose. Well, that's all history now. Statewide, Mary Burke still scored 47% of the vote. That's a phenomenal number considering she was a virtual unknown running against one of the GOP's top rock stars in Scott Walker. Her army of volunteers did an absolutely remarkable job against the national Kochtopus machine. Rock County voters also responded to the challenge and posted numbers that essentially bested their turn-out against the 2010 Tea Party wave and matched the percentages the county posted in the 2012 Recall election. A solemn hat tip. Of note, the cities of Evansville and Edgerton both posted numbers favoring Burke almost 2 to 1. Despite republican candidate Brian Fitzgerald sending out a personal Facebook invite to Paul Ryan, Scott Walker and national RNC chairman, Reince Priebus, for a Janesville pre-election rally, Janis Ringhand defeated the republican wave Kochtopus candidate, 59% to 41% to keep the 15th Senate District in democratic hands. Paul Ryan on the other hand did regain some momentum he lost in 2012. On Tuesday, he defeated Rob Zerban 63% to 37% overall to keep the 1st CD seat under his boot. The 2014 Rock County tally for both candidates was practically a toss-up (50.4/49.4). In 2012 however, Zerban scored 51.50% of the Rock County vote to Ryan's 46.93%. Despite Zerban's defeat, Ryan still lost his hometown and his ward (57.5% to 42.5%) to Zerban for the second time in his political career. Rock County voters also voted in favor of two statewide non-binding referendums (more Affordable Care Act money and raising the minimum wage) by roughly the same margin (65% to 35%). One sore spot for county democrats could be Beloit. Latest reports show Beloit had only a 34% voter turn out in this election when most area communities were reporting 60+. That's unacceptable. View Rock County Election results here. Oligarchs Win! Oligarchs Win! Oligarchs Win! This is a new paradigm, at least for me. I was taught to play by the rules, move ahead without trampling others, stay truthful and that clean government for the people is good government. I'll never stray from those core beliefs, but Scott Walker's victory may change my blogging style in how I play the "game." You can't argue with success I suppose. Playing by the rules lost. ✦ There is only one important thing you need to know about Brad Schimel, the GOP candidate for State Attorney General. He believes a public office holder working for the benefit of a person who has contributed to their political campaign is "the essence of representative government." No joke. ✦ The latest dump of emails and documents from Scott Walker's first John Doe scandal comes as no surprise. If you've been paying attention, the courts were releasing documents every month or two all year long, with people across the state asking Walker to step up and answer questions about his executive role in those illegal office activities. He has refused. Now his flacks try to spin it as a failed "October Surprise" by his opponents. No surprise. It just happens to be October. Walker needs to come clean. The sooner the better. ✦ Has anyone else noticed the Janesville Gazette endorsed more than the usual token one or two local democrats? Their subscription accounts must have taken a severe nosedive over the past several years. They're only doing what's best for their business. Don't be fooled. ✦ Entrenched career politicians are considered "statesman" by the Gazette. Most Americans see their acquired power as a threat to representative democracy and clean government. Not the Gazette. They see them as a conduit for their statist right-wing establishment agenda. ✦ The Gazette has always endorsed a democrat or two in local races. For years, democratic candidates and their supporters considered it a kiss of death. Over the last couple election cycles however, a few democrats they have chosen were GOP walk-ons or chamber of commerce tools. Always watch their picks for president, governor or the 1st CD (covering Janesville and Walworth) to see where their real politics stand. ✦ I heard Forward Janesville supports the tax hike referendum on home owners in Janesville. Of course they do. But only after they've made sure to lock up tax cuts, tax credits and other free stuff from government for themselves. Who is speaking up for the little guy in our representative government? No one. ✦ I hope city government is going to get a resounding message on the upcoming "street repair" referendum. The subject doesn't really matter, it's the point it's a referendum the council wants to put forward, which we don't have the option to ignore. We do have the ability to send a loud and clear message, not that they will hear or care what it is. ✦ I thank Colonel Freitag for his service to our country, but hope he understands that in the civilian world, the taxpayers and residents of Janesville are the generals. ✦ I'm surprised Janesville city manager Freitag seems to be taking the anger many people have toward city government and the council's disrespect for its citizens so personally. Maybe it is well deserved after all. ✦ After embarking on a so-called "tranparency in government" reform by releasing old closed-door city council meeting minutes, the city council seems to be drifting towards more secrecy than ever before by granting administration officials the power to work contract deals without council approval. ✦ If you think for a minute that Mary Burke was "fired" by her brother at Trek - you don't know family, business or family businesses. Mary Burke has been working at Trek for years after the time frame stated in the smear story. Global businesses are in constant flux with their international operations. No company rehires people they fire. It's just more sour grapes from GOP partisan hacks with an axe to grind. ✦ Walker hacks dig up a Trek non-issue non-story from 21 yrs ago, "Crucify her!!" Walker's executive role in two office scandals resulting in six convictions and alleged criminal scheme, false report and conspiracy? meh ..."Old News." ✦ Mary Burke shares our values, but most of all, she'll bring WI together & carry WI forward w/ good jobs & a strong economy. Vote Mary Burke for Governor! ✦ So the national RNC co-chairwoman said some Wisconsin voters are stupid. The GOP has majorities in the Wisconsin assembly, senate, the state supreme court and holds the governor's office. Come to think of it, I totally agree. ✦ OK. I heard it all now. Someone insisted that Brian Fitzgerald's house was a "victim" of his party's gerrymandering. Hilarious. ✦ Apparently, GOP candidate Brian Fitzgerald is far too wealthy to live in his brother's basement. He said if he defeats Ringhand, he promises to buy a house and eventually move into the senate district. ✦ So Brian "beholden to no one" Fitzgerald sends out a facebook invite to Walker, Ryan and the national RNC chairman Reince Priebus for a rally in Janesville and they come a'running. Just a regular guy, uh? ✦ As a Janesville city council member and now GOP candidate for state senate, Brian Fitzgerald ignored Janesville's 3,500+ petition signers asking to place a simple question on the ballot. Voters should likewise remember his "caring" and ignore his candidacy. Vote for Janis Ringhand, who values and listens to her constituents. ✦ So in the name of control, the Rock County board dismantles the coroner's office and turns control over to Dane County with a budget that will cost county taxpayers $140,000 more a year. We must be a self-hating bunch. ✦ Rock County taxpayers will shell out an additional $140K a year for coroner services without creating one or two new jobs. Way to go! ✦ Funny how some people boldly lie about the massive protests that took place in Madison in 2011 and blame protestors for the state's divisive politics. Those protests were a result of Scott Walker's bomb-dropping "divide and conquer" attack on Wisconsin constituencies - NOT the cause of it. Janesville Gazette: "Let Walker Finish The Job"
Packed with half-truths, falsehoods and omissions, the Janesville Gazette as expected endorsed Scott Walker for governor. Since Walker has failed at everything from jobs, schools, roads, healthcare, environment, taxes and the state budget, "letting him finish the job" can only mean one thing. Although the Wisconsin State Journal did at least editorialize over the past four years about Scott Walker's scandals and failures (many Wisconsin newspapers refused to address the subjects), they always seemed apologetic in the end or blaming opponents for his troubles. So I did not see this endorsement coming. Keep in mind the State Journal had previously endorsed Walker. The first sentence is a good hint the paper finally has its priorities in order. State politics is far too divisive under Gov. Scott Walker. Wisconsin lags on jobs and faces its third largest budget shortfall in two decades. I never thought I'd say this, but kudos to the WSJ for making the smart choice. It's a good read all the way to the end. New Study Shows Low-Wage Jobs Skyrocketed During Walker's "Reforms"
According to a new study by UW-MKE professor Marc Levine, jobs in middle-class occupations decreased and have been steadily declining since 2000. But something is happening in Wisconsin since 2010. "Since 2010, the recovery has been extraordinarily heavily weighted — all of the net growth in Wisconsin has been in the low-wage category," Levine said. I would hope that when folks first heard Gov. Scott Walker call public employees "haves" and taxpayers "have-nots," everyone knew he was on a mission to make everyone a "have not." Everyone except for his wealthy elite donor base that is. There is no other way around it. Clearly, Scott Walker isn't fighting low-wage jobs growth, his "reforms" are fostering it. That single "haves and haves not" statement is the crux of his classwar "divide and conquer" strategy ...and it's working. The handwriting was on the wall when Walker's flacks set up data bases and sent out mailers of public employees listing their salaries and benefits to purposely drive wage envy rage in families and communities across Wisconsin. In Janesville, we have seen these mailings first-hand and heard some local officials explain how Wisconsin workers have enjoyed good wages for "too long," and how benefits and even civil rights are "burdens" on economic development. We have seen leaders of the local "divide and conquer" business group, Forward Janesville, literally giggle and gloat because area workers seeking jobs after the GM closure will be forced to take much less pay for their work. It's both very telling and disappointing that many of these operatives are still part of the community or holding important policy-writing public jobs - like as if nothing happened. I obviously don't get it. The hate-based wage envy "divide and conquer" strategy all trickles down from the top and since 2010, it began pouring in Wisconsin. As long as Walker remains governor, there is no let up in sight of this dirty rotten campaign.